I purchased Aqua Lily, along with Halcyon and IKB: 2012, during Rescue Beauty Lounge's Fan Collection Pre-Sale. Natural light. The color of Aqua Lily is a bit deeper in person. Aqua Lily is a bright turquoise/aqua blue (I can't decide which one exactly), with stunning hot pink iridescent shimmers that reflect purple in certain angles/ lights. This polish applies like a dream! And is perfection after two coats. Aqua Lily is a unique, captivating, one-of-a-kind color that I adore! That's why it pains me to write this, but I was disheartened with the wear of Aqua Lily. This nail polish had more chips than a Chips Ahoy Cookie. I've never experienced such extreme chipping as I have with Aqua Lily. By the end of the day, there were larger pieces of polish missing throughout all of my nails. Although Aqua Lily didn't perform to my expectations, I did love originality of this polish; thus, I'll find some way to make it work...even if it means having to re-apply it on a daily basis, and keeping my hands still while I'm wearing it. Are there any polishes in your collection that didn't live up to your expectations? The colour is unique (love the pink shimmer) and looks perfect for summer especially, that's just too bad about the disappointing wear time and how prone it was to chipping though! I thought about give this color away, but it's so unique, that I can't part with it! I have to find a way to make it work!!! Any recommendations on an industrial top coat??? 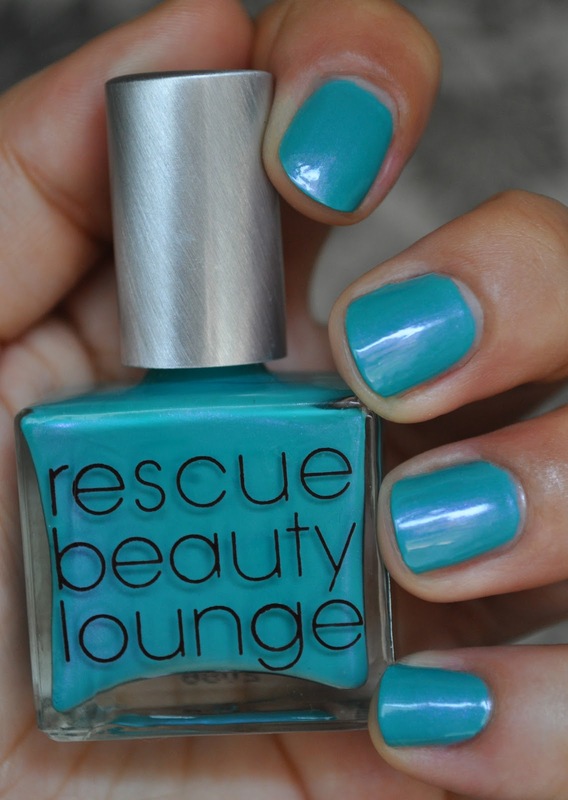 this is such a gorgeous color! i def need it for my collection!